Use the words ‘feminist,’ ‘fairy tale,’ and ‘retelling’ AND YOU KNOW THAT I WILL BE A READER OF THAT BOOK, REGARDLESS OF ANYTHING ELSE. In any case, it was after that that I began STRONGLY BELIEVING that all Fairy Tales SHOULD BE MORE FEMINISTIC so that little girls will grow up knowing how to be strong, independent women. 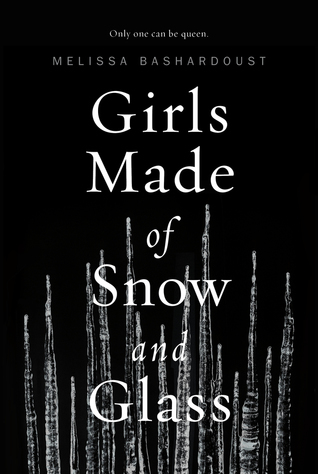 And so when I first read the description of Melissa Bashardoust’s Girls Made of Snow and Glass, I KNEW I WOULD HAVE TO READ IT. And when I got approved to read an advance reader copy, I was OVER THE MOON. Surprisingly, this book took me a really long while to get through. The book was slow paced and filled with introspection and I found myself skipping the long LONG descriptions that came after a few exchanges between characters. 1. 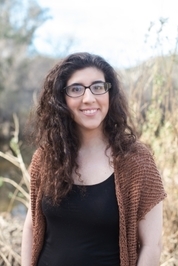 A FEMINISM AND LGBT FILLED FAIRY TALE RETELLING: Did you get all of those words? A FEMINIST. LGBT. FAIRY TALE. RETELLING. Really, can you ask for more? 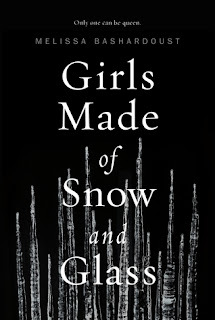 I already read one Snow While retelling earlier this year, Forest of A Thousand Lanterns and I LOVED IT for its Asian cast and anti-heroine but this one WITH MAGICAL POWERS SOUNDED JUST AS GOOD. I was so happy that this book turned the traditional fairy tale into a feminist book because WHAT’S NOT TO LOVE ABOUT THAT? 2. STRONG FEMALE CAST: Most of the book was centred around strong female characters trying to find their way or themselves, and I loved it. Mina (the Queen/ Stepmother), Lynet (the Princess) and even Nadia were all characters that were so well done. 1. THE PACE: THIS BOOK WAS VERY SLOW. It took me days and days to get through it purely because of how utterly slow paced it was. Like I mentioned before – there just wasn’t much HAPPENING in the book and it was filled with introspection from both Lynet and Mina about the SAME THINGS. I honestly felt that if the pace of this book had been different, the book itself would have been so much more enjoyable. 2. DID I ALREADY SAY THE PACE? And that’s it. I absolutely love what Melissa Bashardoust’s book did for feminism in fairy tales considering HOW MUCH we need it, but I would be giving this book a lot higher of a rating if the book was faster paced. 2.75 stars. As much as I appreciate you all, I'm not active on Goodreads, so if you'd like to get in touch, please see the contact page on my website above. Thanks and happy reading! What's your favourite fairy tale, and what's your favourite retelling of that fairy tale? Do you think that faity tales, especially ones with Princesses should have a more feminist touch to it? I'd love to hear from all you lovelies!